I finished my travel blog the other day but I haven't started summarizing my travels until now as I've jumped on a few projects around the house and attended a couple family events. Today I will just focus on my Prius fuel usage. I thought I would hit 20,000 miles on this trip but came in nearly exactly the same miles as last year with the Prius at 19,672 miles. I paid less this year for fuel which was nice, totaling $825.99. The budge it set up was to be under $1000.00. My MPG was unfortunately not measured the same as last year as while my Prius was in for service one of the dealers reset the Ptius trip odometer "B". Last year I got 52.2 MPG using the Prius computer. I know I was getting less MPG this year, so the calculated MPG was 45.6. My average fuel cost was $1.99 per gallon. Why the difference - experimentation! 1. This year I used cruise control more and this gives me generally 2 mpg less than using my foot and paying attention to hills. 2. Last year I worked hard to get the higest mpg and this year I didn't. I just didn't think about saving fuel. 3. I drove more places on dirt roads. 4. I chose to not go to truck stops for showers as much so I would wash in the car heating water with my 12 volt heater and warming the car to fully undress and wash up. 5. I used the Prius to heat the car all night in very cold situations. I don't sleep well when down to or below 20 deg. 6. I ran the Prius many times when parked to treat my house batteries to a long charge before asking them to last all night. In the past year I would allow the fridge to rise in temp when Prius was off by looking at the remote temperature sensor. 7. I left the Prius with air conditioning running when it was parked and hot outside so the fridge didn't have to work as hard and drain my house batteries. 8. When on interstates I traveled 70 mph vs 65 that was my top speed unless behind a trailer truck. Behind a TT I would cruise 8 car lengths behind and go 70 mph and I could get the same mpg as 60 to 65 mph. So the lower gas prices helped me still save this year but I got to experiment with using the Prius to heat the vehicle, when cold outside and cool the Prius for my greater comfort this year. The $108.46 for all extra comfort was worth it if you figure I didn't go for truck stop showers every couple days as I did last year, choosing to fully wash in my Prius. Yes this is totally possible! More about how my travel thoughts and how things worked in other future blog posts. Thanks for the recap, that still is very little money for that many miles. Enjoy being home and look forward to the next post and what you decided to do with going with the truck and camper. How yo doing fully wash in prius ? Actually i have been thinking about posting how I do fully wash in the Prius. So, I will look at doing that but give you a brief answer until I have the post published. The back seats of the Prius are removed. I made a platform on the Passengrr side (60%) for the fixed bed. Behind the drivers seat (40%) side I have a seat I made. I make my hot water earlier and put in my 24 hr thermos. I have a small wash basin. The kind they give in hospitals. I have a squeeze bottle I set up with warm water. While undressed and sitting in the seat I put towel on lap and basin on top of the towel. I put warm water in the basin and use face cloth to wet and wet hair. Then I use shampo to wash hair and with my head bent over basin I rinse my hair with water in squeeze bottle. I have a separate towel to dry my hair. With hair done I now sit on my bed and face towards the seat with the basin on it with my fear on rather side. Basin still has soapy water from washing hair. I now use soap and face cloth to wash body starting from top to bottom. I end with washing feet in the basin one by one and using warm water from squeeze bottle. I pour the dirty water in the basin in my waste water tank. I'm done! It takes about 1/2 hour. 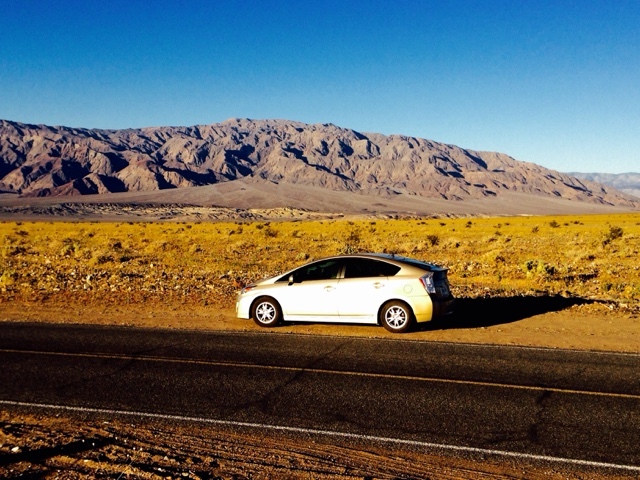 Here is the link to the blog on how I wash in the Prius. Hi Brent, I know you are not full time.. for the mileage figures, how many days were you on the road? Thanks! My 2016 travels started Jan 4 and I returned May 1 - so you can say I was gone a full 4 months.